futures . . . Here’s our month-by-month breakdown of the major acquisitions of the year. This entry was posted in NewsBlog and tagged Greentech Media, PV Magazine on December 28, 2017 by Helen Deffenbacher. Des Moines, Dubuque, Fairfield, Iowa City, Cedar Rapids and other municipalities have pledged to seize opportunities to reduce greenhouse gas pollution. Growing local solar energy, storage and energy efficiency creates jobs, saves money, attracts investment and avoids carbon pollution. Local energy production keeps energy dollars in our communities, instead of paying to import electricity generated by coal, gas and uranium. Clean electric vehicles and buses in municipal fleets reduce fuel and maintenance costs, and avoid pollution. Improving energy efficiency in city buildings saves taxpayer money, reduces pollution and lessens maintenance costs. Read more here. 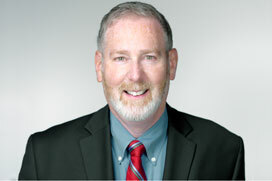 Howard A. Learner is the Executive Director of the Environmental Law & Policy Center, a leading environmental progress and economic development organization in the Midwest. 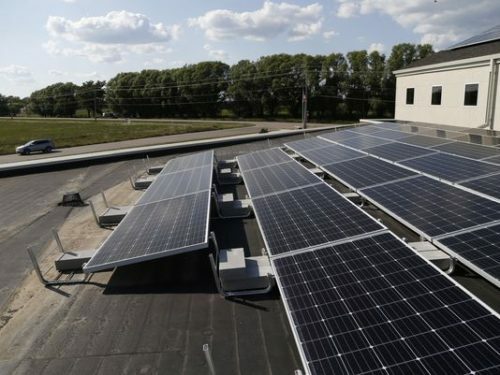 Top Photo: Solar panels on the roof of St. John the Apostle Catholic Church in Norwalk, Iowa. Starting in the 1950s, some companies and countries began to deploy next-generation high-voltage DC transmission lines . 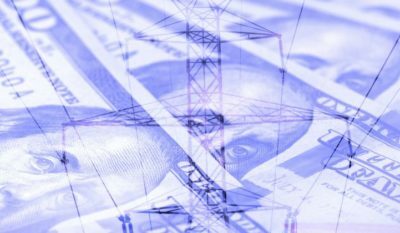 . . For the past two years, James McCalley, an engineering professor at Iowa State University, has been studying the best way to tie together those massive grid systems as part of the Department of Energy’s $220 million Grid Modernization Initiative. A national direct-current grid could also help lower emissions, by as much as 80 percent below 1990 levels within 15 years, all with commercially available technology and without increasing the costs of electricity, according to an earlier study in Nature Climate Change. 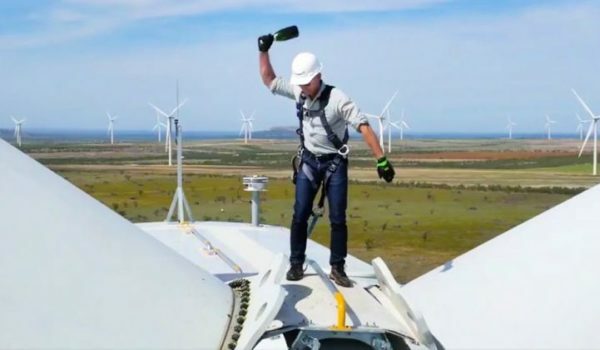 This entry was posted in Nebraska / Midwest News and tagged DOE's Grid Modernization Initiative, economic benefits of climate action, Environmental Law & Policy Center, Howard A. Learner, Iowa State University, James McCalley, national direct-current grid, U.S. cities leading on climate action on December 28, 2017 by Helen Deffenbacher. KEARNEY — On Aug. 22, Central Community College began classes in its $23 million, 66,000-square-foot Kearney Center. The structure was completed without a bond issue using $10 million from a successful capital campaign and cash from CCC’s reserves. The new building didn’t tap taxpayers, and because of its design, the building someday won’t tap commercial power, as CCC leaders have deemed that the facility eventually will be energy self-sufficient. Click here to read the entire article, the third installment recapping top stories of 2017, as selected by Kearney Hub reporters and editors. 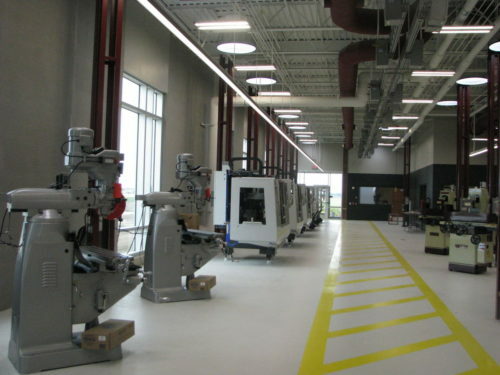 Photo: The skilled technology science wing of Central Community College’s new Kearney Center offers some of the most advanced manufacturing equipment to train students. Visitors at the Columbus campus can see some of the efforts undertaken in recent years to reduce the carbon footprint there, such as hybrid cars, electric maintenance vehicles, a bike-sharing station, water bottle station, landscaping with native plants and recycling bins. Across other Central campuses, there are composting sites, bee colonies and solar panels, and the campus in Hastings [added] a 1.7-megawatt wind turbine. This entry was posted in Green Campuses, Nebraska / Midwest News and tagged Nebraska colleges & universities, renewable energy education, sustainability initiatives at Nebraska colleges & universities, The Kearney Center on December 27, 2017 by Helen Deffenbacher. Promoting economic growth is a concern across the country. Communities have organizations in place whose main function is to pursue that goal. We have slogans like “buy local” to keep money in communities where it is recycled through the community stimulating economic growth. For Iowa “buy local” means use renewable energy. Our state produces no fossil fuels. Every dollar we spend on coal, oil, and natural gas is a dollar sent out of state we have to work hard to get back into our economy. Iowans know the economic benefits of our renewable energy sector. Continue reading. This entry was posted in Nebraska / Midwest News and tagged economic benefits of renewable energy deployment to local communities on December 26, 2017 by Helen Deffenbacher. 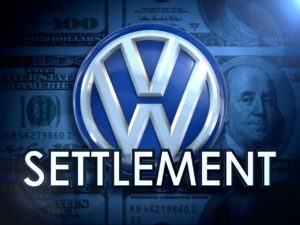 The Nebraska Department of Environmental Quality (NDEQ) has been designated by Governor Ricketts to administer funds allocated to the state from the Volkswagen Environmental Mitigation Trust. The initial allocation to Nebraska is approximately $12.25 million. NDEQ has released Nebraska’s draft mitigation plan, which is available for download HERE. NDEQ is soliciting public input on the draft plan. Comments will be accepted through December 31, 2017. Instructions for submitting comments are available by clicking the link, above. 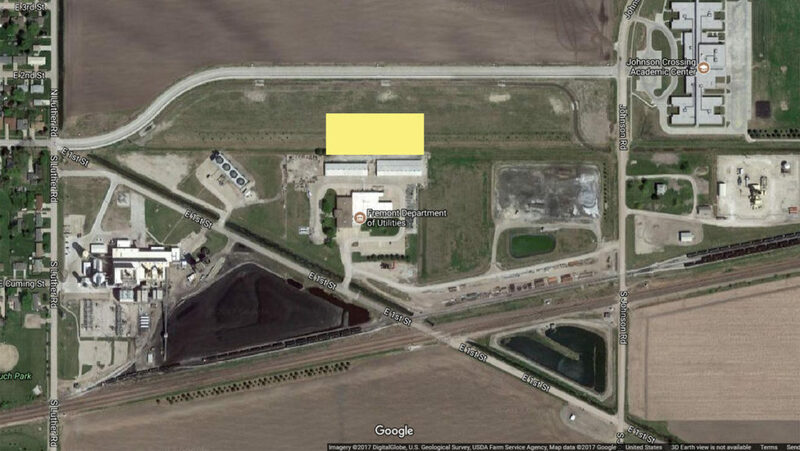 This entry was posted in Nebraska / Midwest News and tagged Nebraska Department of Environmental Quality, Nebraska's Volkswagen Environmental Mitigation Draft Plan on December 24, 2017 by Helen Deffenbacher. [Those] hoping that oil companies will flock to the refuge—and that revenues raised can help offset some of the deficit created by the tax bill—might be sorely disappointed, said Bud Coote, a senior fellow with the Atlantic Council’s Global Energy Center. “In the current economic environment, it’ll be a tough sell,” he said . . . 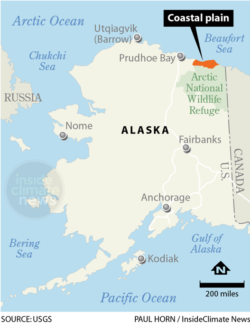 In late October, a poll conducted by the Yale Program on Climate Communication found that 70 percent of Americans oppose drilling in the Arctic National Wildlife Refuge and that only 18 percent of Republicans “strongly support” it. [Sen. Maria Cantwell], who is the ranking member on Senate Committee on Energy and Natural Resources, said that those who want to protect the refuge will capitalize on the public support going forward. Electric Trucks Begin Reporting for Duty, Quietly and Without All the Fumes: Replacing fleets of medium- and heavy-duty trucks can help cut greenhouse gas emissions and make cities quieter and cleaner. This entry was posted in NewsBlog and tagged Arctic National Wildlife Refuge, Center for American Progress, Electric Vehicles, Inside Climate News, Senate Committee on Energy and Natural Resources, tax credits for solar and wind energy, Yale Program on Climate Communication on December 24, 2017 by Helen Deffenbacher. The members of the Nebraska Farmers Union support an increase of the maximum guaranteed access level for net-metering from 25 kilowatts to 100 kilowatts. Secondly, the members support changing and updating current state law to allow single owners the option of aggregating their multiple meters for the purpose of net metering. Click here for complete details about all five NeFU top priorities for 2018. This entry was posted in Community Partners, Nebraska / Midwest News and tagged Nebraska Farmers Union, Nebraska Farmers Union's Special Orders of Business for 2018, Nebraska's net metering law on December 24, 2017 by Helen Deffenbacher.